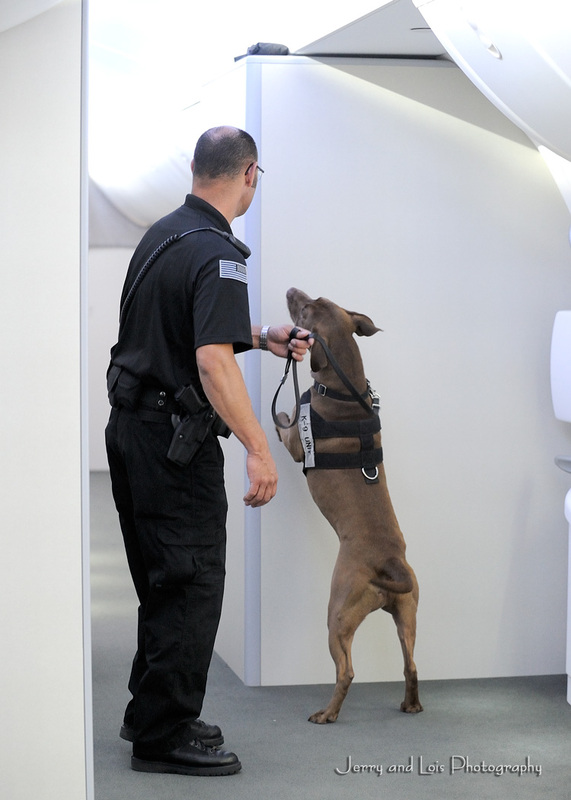 During a training exercise, 5-year-old Jax sniffs an overhead luggage site for hidden explosives while his handler Ly Keu watches. Each has a highly trained two-legged partner, usually an ex-military, police or sheriff’s officer, works four days on, three days off and is an integral part of that officer’s family at home. The local unit is one of four deployed in the U.S. Another is situated in Wichita; the company contracts with private security agencies for additional teams in Chicago and Southern California. 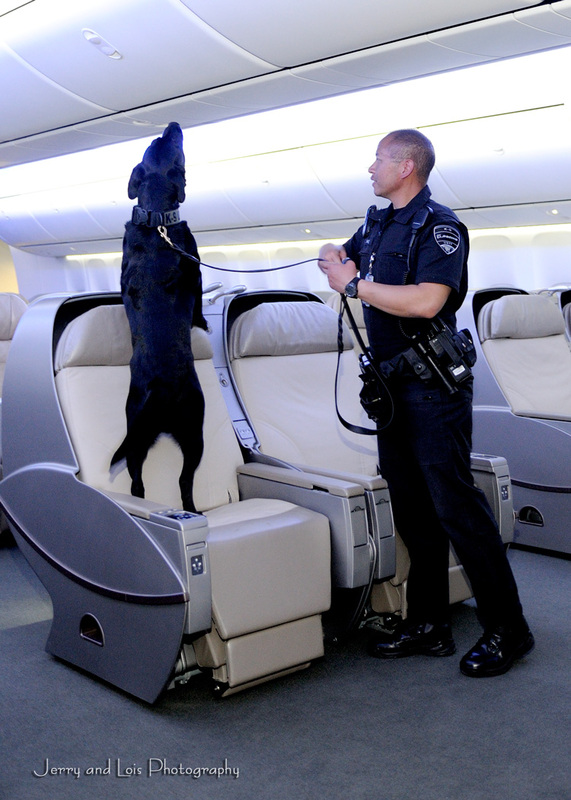 The decade-old program, the outgrowth of Boeing’s need for enhanced security following 9/11, began with mostly German shepherds and Belgian Malinois and has segued to Labrador retrievers and Lab mixes. 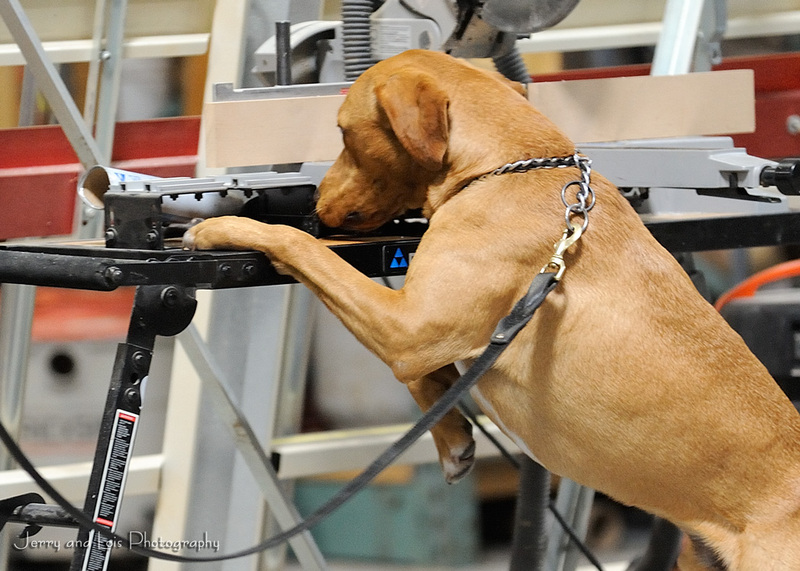 Trained to identify and alert to 17,000 different explosive-based chemicals and compounds, some of the newest team members are former shelter dogs, says Melissa Larsen, trainer and an original team member. Earlier ones were graduates from the prestigious Auburn University Canine Detection Training Center at Fort McClellan, Ala.
John Decker, senior manager of the K-9 program, and Larsen select the canine candidates based on an assortment of criteria. “What are we looking for? Typically a Lab mix with a very high ball drive. When I test the dogs I look for their ability to use their nose to search for the ball. I don’t care if they find the ball, the main thing is they don’t give up looking and don’t get distracted. We like to take them away from their normal environment to do the testing, since this is usually where distractions will play a big part. Jax sits in front of a “find,” which he is trained to do. The dog was rescued from the Progressive Animal Welfare Society shelter in Lynnwood. The dogs live with Larsen during their ensuing 90-to 120-day training. Once an animal is trained on odors, it is paired with a handler and joins his/her household. Training continues for the pair until they are ready to certify as a team. Pairing partners is critical but not difficult, Decker explains. “You look at personalities. You want to match a high-drive animal with a similar officer. Mixing opposites breeds total frustration and lack of production. The teams are often the public face of the company at shareholders meetings, customer product delivery events, on the field and flight lines during flight tests, at major employee forums and occasionally traveling together on commercial airline flights. They sweep the premises of Boeing facilities for hazards or explosives along with screening incoming vehicles, abandoned briefcases and packages. They are available to be called in by outside law-enforcement agencies for bomb threats or work special events involving dignitaries. Typical finds, explains Larsen, are guns and ammo in delivery trucks or contractor vehicles every few months. Decker refuses to place a price tag on the unit’s earlier dogs, but it is not unusual for an agency to spend $20,000 for a fully trained animal. Because today’s new members come from shelters, adoption fees are sometimes waived or don’t exceed $100. Additional savings are recognized by in-house training. Handler Tony Lowry holds Gizmo, which focuses on the scent of a training article. Gizmo was obtained from the Humane Society of Skagit Valley in Burlington. Because training is key for keeping each team razor sharp, all undergo a weekly session of four hours or more. When Larsen spots an issue, that pair undergoes additional fine-tuning until the matter is resolved. Typical problems are a reaction to loud noises or surface issues, like a slippery floor. Because weather affects dogs’ scenting abilities training takes that into account, too. Intense heat not only saps the animals’ energy quicker but hot pavement can burn their pads. Snow and cold force them to work longer and harder. Wind, however, is the most challenging element, since it can drive odor away from the target item. Each team is recertified annually in a two- to three-day test where explosive training aids of varying weights and sizes are planted in five areas, which can be a vehicle, open space, warehouse, office or bus. A passing score is 90 percent. Failure to attain that requires the team to be retested within 30 days, either on the entire test or one facet only at Decker’s behest. Tycho finds his search object atop a piece of machinery in a Boeing Co. warehouse. Being family members, the dogs must interact smoothly with small children and other pets. Hence, another reason the Labrador retriever is the breed of choice. Huey, for instance, a 73-pound, 4-year-old yellow Lab, replaced handler Jeff Johnson’s previous partner, Yale, which continues to live with Johnson and his wife, Jennie. 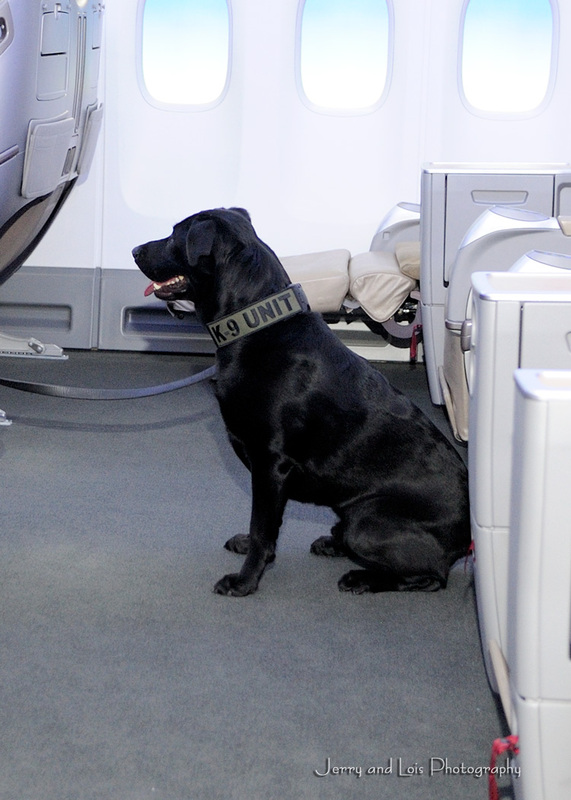 Johnson joined the Boeing K-9 team in 2007 after serving eight years in the Air Force as a military police-dog trainer, where he chiefly worked Belgian Malinois and German shepherds. 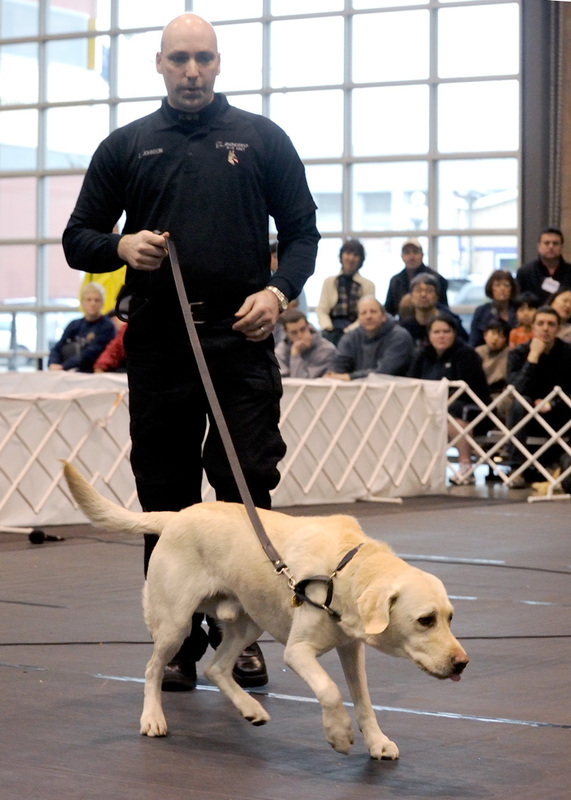 Handler Jeff Johnson and Huey search for a scented item at the Seattle Kennel Club Dog Show in March, during a demonstration that drew a large crowd. The unit makes numerous public appearances throughout the Puget Sound area each year. matched with a law-enforcement or private company unit member. Johnson spent two weeks in training at Auburn with Huey, each acclimating to the other. “We moved forward rather quickly,” he says. The dog’s favorite leisure activities include retrieving a Frisbee, walking in dog parks and hiking with the family.